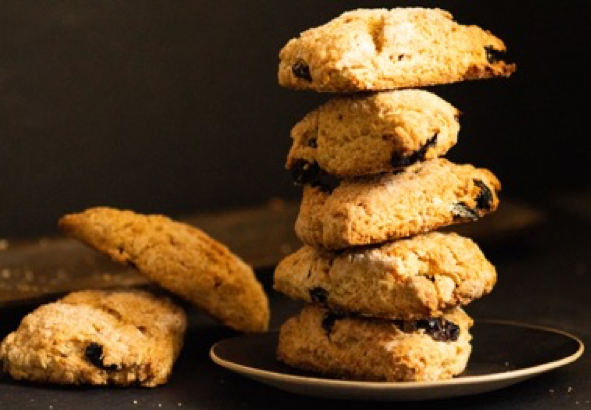 Vegan Raisin Rosemary SCONES for St. Patrick's Day---YUM! ST. PATRICK'S DAY IS ALMOST HERE! So there's no better time for a scone. THESE--BEING VEGAN--ARE OBVIOUSLY NOT TRADITIONAL, BUT I LIKE THEM EVEN BETTER. They have a crispy exterior and a tender, satisfyingly crumbly texture inside. The raisins and rosemary add sweetness and a subtle herby twist. And even though they are an excellent vehicle for some kind of buttery or sweet spread, THEY ARE PERFECT ALL BY THEMSELVES. Real scones are loaded with butter and heavy cream which means a ton of calories. That fact alone always makes me hesitate. I start doing the caloric calculations in my head, before I take that first bite. And then, I start to wrestle with the question--"IS THIS REALLY WORTH THE EXTRA POUND? These, though, are as healthy as a scone can probably get, subbing in coconut oil for the butter, and almond milk for the heavy cream. Being vegan, you also will be using flax eggs in the mix. But don't worry they're super easy to make. And don't balk over the rosemary, it really does add a delicious twist. But, you can certainly leave it out if you don't feel that adventurous. can use all all-purpose flour. brown, and adds to the crumbly texture. Sub in regular sugar if you like. the flax eggs, but it will change the texture a little bit. used instead of currants. or raisins. 2. Yes, rosemary might be an unusual addition, but it really is delicious. I highly recommend that you give it at try. Not sure? Give the 3/4 teaspoon a try. 3. Depending on the time of year, your coconut oil may be of a more liquid consistency. It needs to be fully solid, but not frozen. Chill it for 20-30 minutes in the fridge to harden before using. 4. Don't over mix the dough, you want some small pieces of coconut oil to still be visible. Make the flax eggs: In a small mixing bowl, combine the 1 Tablespoon ground flax seeds with the 2 ½ Tablespoons of water, and let sit for 5 minutes to thicken. Add the almond milk and vanilla. Stir to combine. In a separate medium-size mixing bowl, combine the all-purpose flour, spelt or whole wheat flour, organic cane sugar, baking powder, salt, and rosemary. Whisk to combine. Add the mixture into a food processor, and pulse a few times. Add the coconut oil and pulse 5-7 times until only small pieces of the coconut oil remain. Alternatively, you can use a pastry cutter (or 2 knives). Place the mixture back into the medium-size bowl. Re-stir the flax-almond milk mixture once more. While stirring with a spoon, add the liquid to the dry ingredients a little at a time. Gently stir in the raisins until just combined. Turn the mixture out onto a floured surface and use your floured hands to form it into a disc about 1 inch high. Use a large, floured knife to cut the circle into 8 -10 even wedges. Using a floured spatula or your hands, gently transfer the scones to the prepared baking sheet with space between them. Generously sprinkle the tops with more cane sugar. Bake for 27-29 minutes until they are a deep golden brown all over. Let cool slightly before serving. Serve hot out of the oven. Any extras, once completely cooled, can be stored at room temperature in a foil-lined container for up to 3 days, and frozen for up to 3 months. You can also reheat them in a 300 degree F oven for a few minutes to re-crisp them.